IX Triple Pendant, by &' Costa, is imported from Italy. 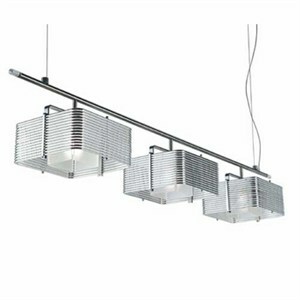 Inner diffusers of aluminum and plexiglass are neatly wrapped with stainless steel for this 3 light linear pendant. - Dimensons: 59.5" L X 9.8" W X 9.8" H pendant has 6' of wire and can be field shortened. - Uses 3 X 60W max E12 (candelabra base) lamps.